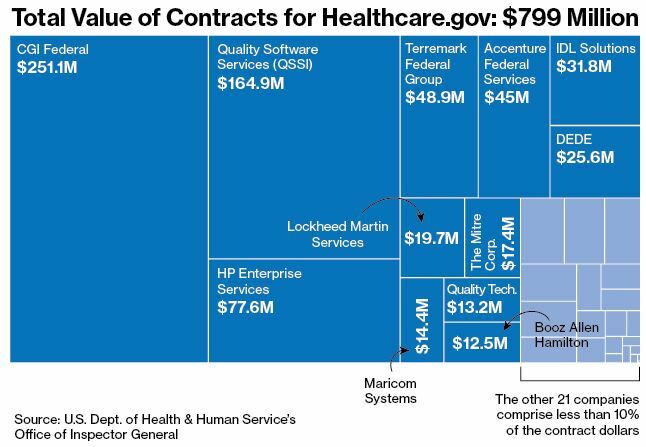 Government contracts with a major vendor building HealthCare.gov drew scrutiny in the past, a 2007 audit shows. In 2011, the Centers for Medicare and Medicaid Services awarded Canada-based CGI a $94 million contract to construct the public face of the Obamacare insurance marketplace. According to BusinessWeek, that contract has reached a value of roughly $277 million. The website hosting the marketplace, HealthCare.gov, has been barely functional at best since it launched on Oct. 1. Six years ago, CGI’s compensation for work on another CMS website raised eyebrows. The company received $2.6 million in “questionable payments” for a revamp of Medicare.gov and an existing claims appeals system to handle prescription drug benefits. CMS may have violated its own rules in some payments to CGI, and at least four of the company’s invoices contained suspicious charges, according to a government audit. The fees, found among a $25.7 million sampling of bills, were questionable because they were potentially improper, unsubstantiated or wasteful, the audit said. Examiners identified questionable payments to CGI and about 15 other contractors implementing the 2003 Medicare Prescription Drug, Improvement, and Modernization Act.